ACL’s Girlfriend | Ralph Lauren SS10 | A Continuous Lean. There is no reason why you should be reading these words and not looking at the amazing photos below. There is nothing I really need to say other than, look at the images below and enjoy the pure beauty and spectacle that is a Ralph Lauren fashion show. If there is one event I wish I would have attended this New York Fashion week, this is it. This first picture of the young lady in the overalls, good God, stunning. wow. i really like the looks and i’m glad (finally) someone is doing some old americana stuff for women (rag & bone came close, i guess). Good Lord!! Unreal……Look 1 is amazing. Seriously channeling the Great Depression! Very nice. Agree with Andrea about the Depression styling. I love seeing comments from other women readers on ACL! My best friend and I are both ACL readers and often discuss/debate what the “true” equivalent in women’s Americana styling is – and we both play with our own versions. 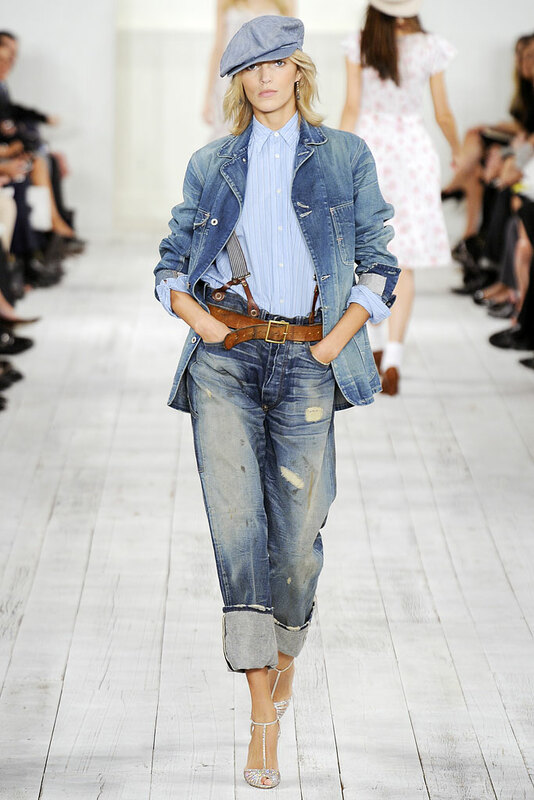 It’s definitely not as straightforward for us- especially since we are not all 6’0 models and denim (regardless of the level of distress) overalls do not look chic on us all- there is a lot of subtleties and value from this show to add to my styling arsenal. I don’t need you to start focusing on women’s fashion- but thanks for showing us your ‘girlfriend’! If the Great Depression is indeed the inspiration for this collection than things have a hit a major low point. Beautiful girls, though. I’ve always preferred the Women’s lines to the Men’s. I…uh…good God. 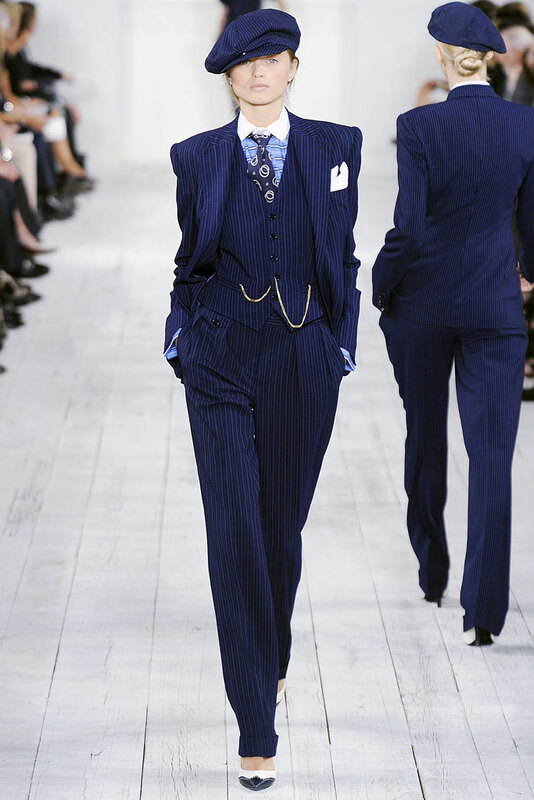 Ralph Lauren is always, always my favorite, and this collection was no exception. If you really love his work, though, you should check out the side projects of his VP Publishing and long time (30+ years) behind-the-scenes creative force (and also my cousin several times removed) Mary Randolph Carter. Google her. She’s incredible. I’m just not feeling it. Some of those of those looks feel very contrived. I guess it’s partly because my wife’s style is not like this, even though she likes the era these clothes are inspired by. I could see her in the dresses in the top right and bottom left corners, but as for the rest, I don’t think they would flatter her or many other women. The girl at position: x=3, y= -1 would garner a proposal. I’ve always loved a women’s look that has bits of roughness like this to help accentuate a women’s inherent natural elegance. Seems to me that women appear even more gorgeous when setoff by a rough and rugged backdrop. Good stuff. 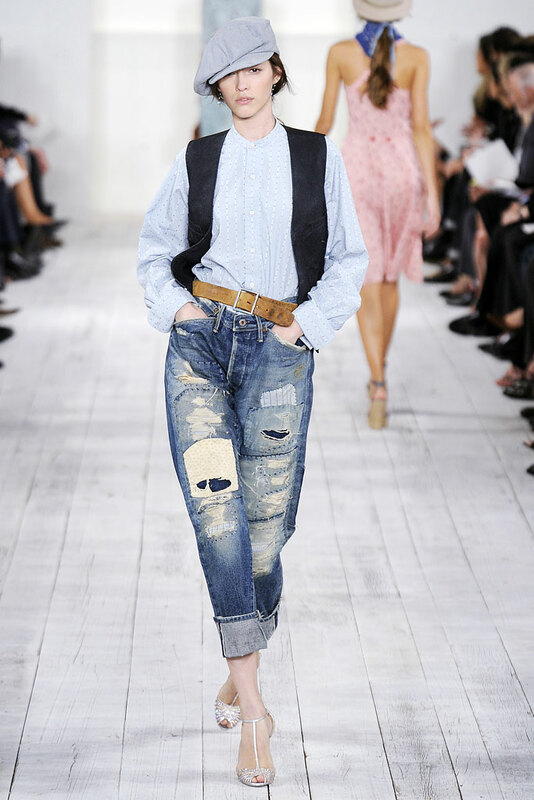 The “destroyed” denim look as a marketing gimmick is such a wasteful indulgence in my opinion. That said, if one were to wear the denims through to that state from untainted new condition, that is authentic character. the outfit is definitely contrived, but if they were your jeans you wouldn’t be saying that right? True. I have worn my Ralph Lauren jeans from squeaky brand new to the point everyone thinks I purchased them destroyed with whisking. I always say “now why would anyone do that?” At least 3 rides per week on the road bike, thank you very much. And I firmly believe I may be the only guy who wears his “high-end” jeans (APC Rescue) on motorcycle rides. Nothing blows the mind of a downtown fashionista quicker than riding up on a Triumph and stepping off with a layer of soot on my shins, grease spots on my thighs and fading on the inner knee area caused from engine heat. They get the other 3 days of riding. I save the 7th day of the week to wash the bikes. Smile! Easy with that rabbit Lennie. unfortunately, it’s highly unlikely that girls around my town (kaohsiung, taiwan) would even consider dressing like that…. that first photo with the bibs. everything right and everything wrong about fashion. in one image. Finally. Some inspiration for a woman who is not a typical denim consumer. We need more of this. Please. Not a fan of the shoes except 3 & 12. Glittery leather is hideous. that is really nice and what I have been waiting for, now it should also be high fashion for men to wear the same thing ! I am an middle aged male professor, wearing overalls as much as possible,a made overalls my signature or uniform, but I really hope that overalls will open for a more relaxed fashion, not only for women but also for men ! take a look on my blog devoted more or less to overalls ! Adore the red dress w/denim jacket. RL is king.